South Korea has a strong economic relationship with Ireland; in 2009, trade stood at €592 million The Free Trade Agreement (FTA) between the EU and South Korea brings further benefits for Irish exporters as it eliminates almost all import duties. 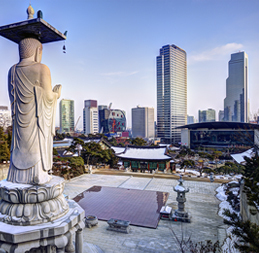 For more detailed information when trading with South Korea, download our South Korea Fact Sheet. For an estimate of landed costs (duties, taxes and other import fees) for shipments going to South Korea use the free and interactive DHL Express Trade Automation Services (TAS) tool, tas.dhl.com. TAS also provides information on regulations compliance and trade documentation. The EU-South Korea Free Trade Agreement allows for a reduced or nil rate of duty for Irish origin goods. For further information on what documentation you need to provide to support the claim for duty relief, visit www.revenue.ie. E-commerce shipments (B2C) are declared as formal entry regardless of invoice value. De minimus clearance is not permitted. This includes articles of paper, printed books, apparel and clothing accessories, footwear, CDs/DVDs, furniture, lamps and lighting. Korea Customs Service is very strict on undervalued shipments, vague descriptions (e.g. sample, spare parts) and inaccurate company name/address, all of which can result in additional delays and penalties. General correspondence (business or private) is under strict Customs supervision to detect illegal goods concealed as document shipments. Certain items, as specified below, are subject to quarantine inspection by South Korea’s Animal and Plant Quarantine Agency (QIA); approval by South Korea’s Ministry of Food and Drug Safety (MFDS); approval by South Korea’s Ministry of Health and Welfare (MOHW); or approval by South Korea’s National Radio Research Agency (RRA). Formal import: subject to quarantine inspection by QIA; receiver must have import licence. Samples imported by licensed companies for private consumption: 1 bottle can be imported without quarantine inspection, though formal clearance is required. Receiver needs to pay liqueur tax regardless of invoice value. Total amount should not exceed US$ 400. Unprocessed: Subject to quarantine inspection by QIA. Shipper to provide quarantine inspection report on collection at country of origin. Bovine products: receiver to provide Certificate of Non-BSE (Bovine Spongiform Encephalopathy) Product from MFDS. Licensed importers: provide recommendation from related organisation. Subject to quarantine inspection by QIA. Artwork including drawings: ship as goods. Artwork including proof/layout: ship as documents. Adhere to the International Transport Association’s (IATA) Dangerous Goods Regulations. RRA certification required. Certain items will require certification by South Korea’s Law of Electrical Appliance Safety Management or Law of Electrical Communications Apparatus; contact DHL Customer Services before shipping for more information. If value exceeds US $100: state trademark/brand name on the invoice. Health products and vitamins: 6 bottles permitted per Waybill. Other drug products: provide component analysis table. Attach additional prescription for personal use. All importers other than individuals should be licenced and receive import approval from MFDS or MOHW. Subject to quarantine inspection by QIA, unless canned or tinned. If value exceeds US$ 150: provide Certificate of Origin. Jerky: Certificate of Origin required regardless of value. Provide component analysis table. Adhere to the International Transport Association’s (IATA) Dangerous Goods Regulations. If free of charge and not for resale purpose: send as documents. Acceptable only for military bases or military officers. Ship as goods regardless of use or purpose. Subject to quarantine inspection by QIA. Soil must be completely removed, or the shipment will be destroyed (charge: US$ 90) or returned to origin. Contact DHL Customer Services before shipping to ensure the plants are not restricted..
Show full description, quantity and name of vessel on invoice. Penalties may be incurred if manifest is unclear. For medication from China, perishables and x-ray machines please contact DHL Customs Services before shipping.